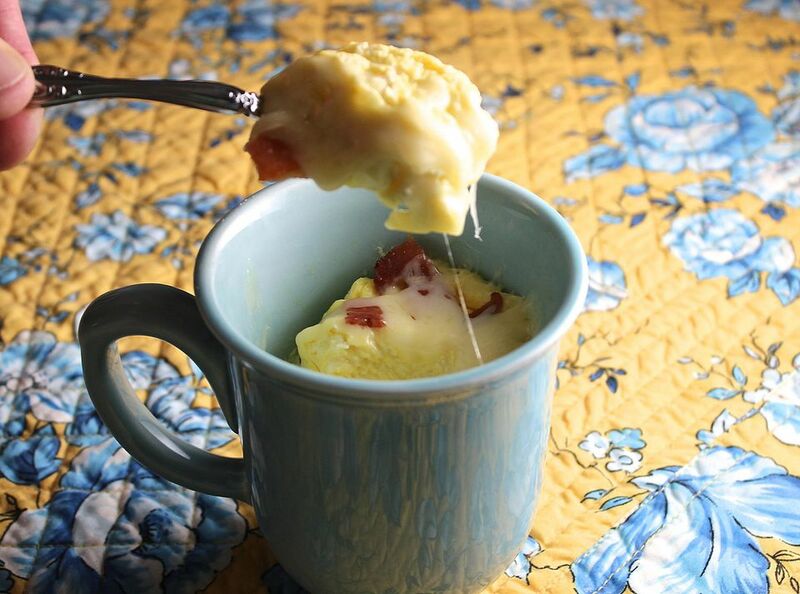 Microwave omelet in a cup is a wonderful, adaptable, five-minute recipe that will streamline your morning routine. All you need is a couple of eggs, milk, sour cream, a microwave-safe mug, and a microwave oven. Fork to mix and (wash before you) eat. Add any type of cheese, meat, veggie, or whatever to this great recipe. Spray an 8-ounce microwave-safe mug or cup with nonstick cooking spray. Drop the eggs, milk, and sour cream right into the cup and mix with a fork until blended. Add salt and pepper or any other herbs or spices you'd like to taste. Then stir in the add-ins, if using. Microwave the egg mixture for 2 minutes for an 800 to 1000-watt oven (most of them today), 2-1/2 minutes for a 600-watt oven, or 3 minutes for a 400-watt oven. If you like fluffier eggs, remove the mug from the microwave and stir after 1 minute, then return and finish cooking. You may have to experiment to find the right time for your oven. The omelet should puff up over the top of the cup, then it will retreat somewhat when you take it out of the microwave. The eggs should register 165 degrees on a food thermometer. (You'll only need to test it once; after that, the time should be the same as long as you keep the ingredient amounts the same.) Sprinkle with a bit more cheese, let stand for 1 minute, then eat! The proportions are 1 tablespoon milk or sour cream per egg. For two eggs, use one tablespoon of each. For three eggs, use one tablespoon milk and 2 tablespoons sour cream. If you make this often, you might want to cook some onions, bell peppers, or sausage or chicken and freeze in small quantities. Then just defrost the frozen goodies, add to the egg mixture, cook, eat, and go! Recommended add-ins: Chopped cooked bell peppers, onions, mushrooms, cooked sausage, finely chopped cooked chicken, ham, crisp bacon, shrimp, more shredded cheese, cooked potatoes, sun-dried tomatoes, or any other cooked or tender vegetable.